Jane Robertson died 24th August 1939 aged 66. Husband Donald Allen (Scottie) of Newlands of Niandt died 26th August 1961 aged 89. 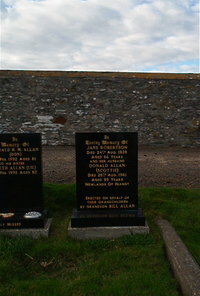 Erected on behalf of their grandchildren by grandson Bill Allen.